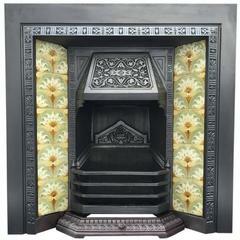 A charming and ornate 19th century Victorian cast iron fireplace insert with exquisitely cast side panels and a polished fire hood showing a central urn flanked by Cornucopia and bell flowers and swags. A generous sized piece that is stamped with a Registration number dating this piece to 1891. Probably cast in Falkirk, Scotland. Scotland 1891. A medium sized 19th century Victorian cast iron fireplace insert, showing good quality casting, probably cast in Falkirk, Scotland, circa 1860.